Nothing has made me feel worse in the kitchen than macarons. I know they have plagued many a home baker but I thought I would tell my story anyway. I am a perfectionist. Sometimes this is a great asset and serves me very well but often it just produces crushing dissapointment. Oxford is a punishing place to be a perfectionist. It just isn't possible - something had to give, and that was my confidence. I will be very happy when I finally finish at the beginning of June. Don't get me wrong - I love my degree and tutors and Oxford is a lovely place in many ways - but it has been tough for me. 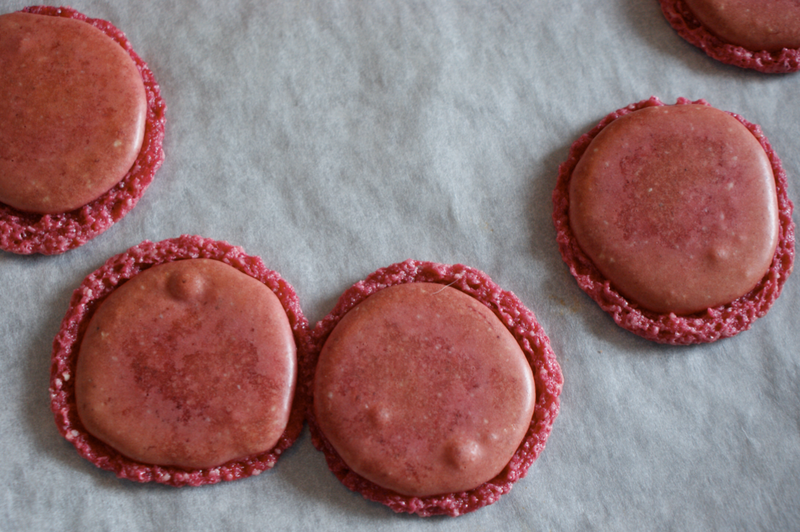 I decided to tell you about my macaron failures (and even publish the awful pictures) as part of a plan to accept them and to be kinder to myself. I can strive for my best, but I need to stop beating myself up about failure in all parts of my life. Learning to bake should be a process of accepting failures and faults and understanding them so you can improve. 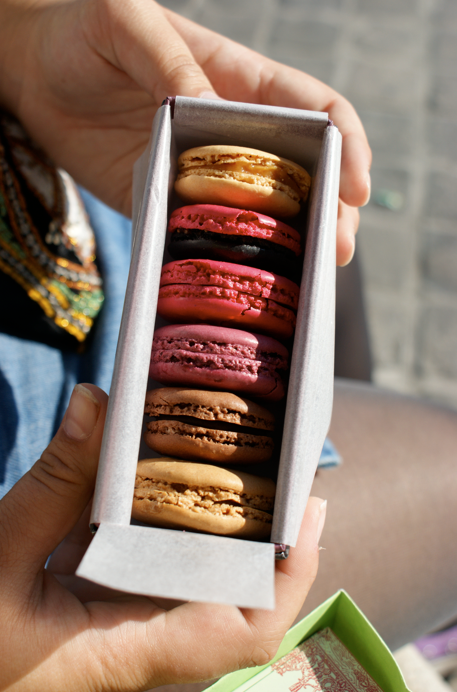 I first tasted a macaron sitting on the sides of the Arc de Triomphe in blazing sunshine. It was September 2009 and my housemate Sarah and I were on a trip to Paris. We had picked up a box each (above, though this was Sarah's) from Ladurée and after a slow walk up the rest of the Champs-Élysées we settled down to our tasting. They were delicious, but I have to admit I had expected more after the hype. They're not my favourite pastry to eat. The photo below shows my first ever batter resting before baking. It was last April and I decided that I finally had gathered enough courage and information to attempt a batch. A few days before I had admitted in this first blog birthday post that I wanted to train as a pastry chef. 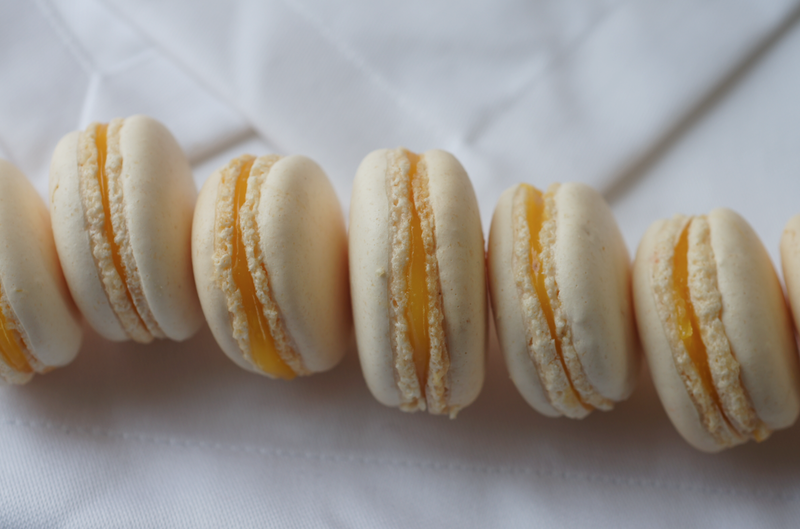 Now, surely, I had to show that I could do it and make macarons. 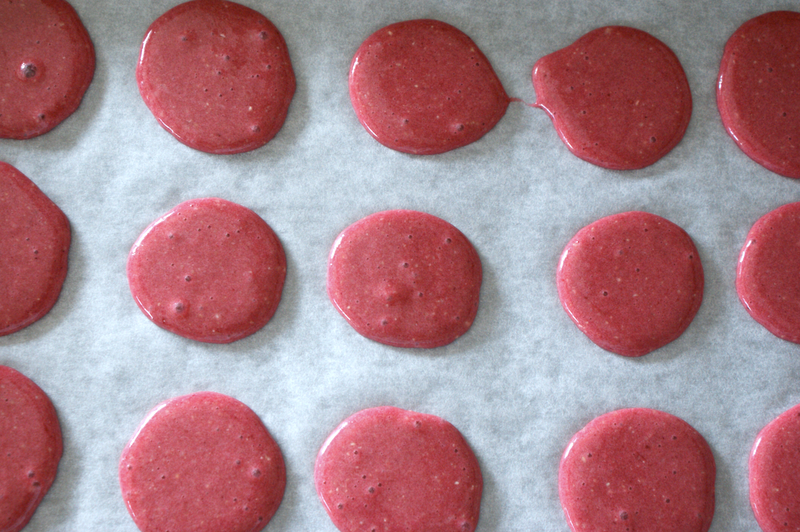 I bought special powdered food colouring for my berry macarons and flew it home. After much deliberation, I chose to make them through the French meringue technique as I wasn't experienced with Italian. I looked through many recipes until I decided to try Tartlelette's recipe from her useful guide. I was so excited - surely they would be pulled out of the oven with a flourish looking just like Helen's. A lot of hope rested on them as I placed them in the oven. Would you like to see what I pulled out? It still pains me. Later that day I tried again with another batter, below. I have to admit that I cried - despite the slight improvement. I know it's pathetic to cry over a deformed macaron - especially only on your second attempt - but I did. Mum pointed out that some of them look like human cheek cells, complete with cell wall and a nucleus. She always knows how to bring a smile back to my face. Two more botched bright pink batches later, I tried a plain batter with no colour or flavouring. These came out mildly better again, with more compact feet. Yet still they were nowhere near what I wanted. 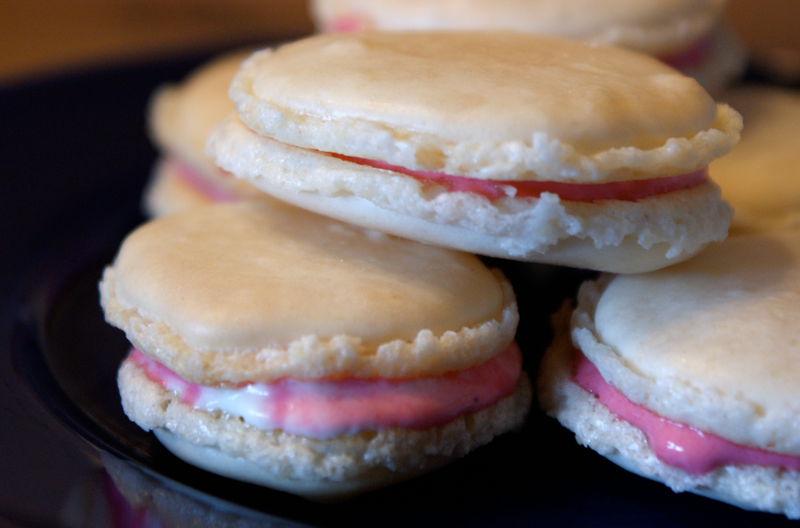 For the first time I bothered to fill them with some raspberry puree mixed with yogurt. They were too sweet even with the filling. At this point, Mum told me I had to stop. I was only upsetting myself. This Christmas I tried again (after yet another attempt last term) and made some chocolate macarons with a bitter chocolate ganache. These came out better again. I actually let people other than my mum see and eat them. Finally, I tried out the Italian method a few days ago. From the beginning it just seemed to work. I much prefer this method. 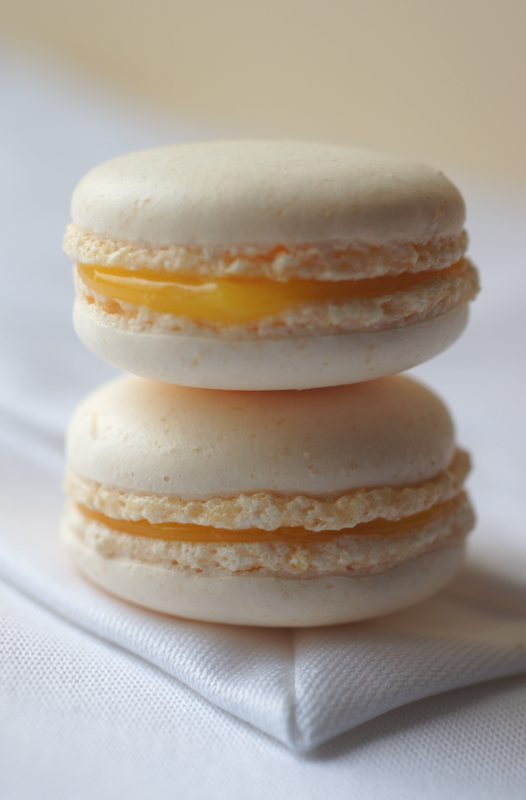 I chose to make lemon macs as I had spare curd and I thought I would prefer something that cut throught the sweetness. This is the first batch I actually enjoyed eating. Though I do have a sweet tooth (obviously), I like my food to taste of more than icing sugar (which, incidentally, is my main problem with a lot of cupcakes). 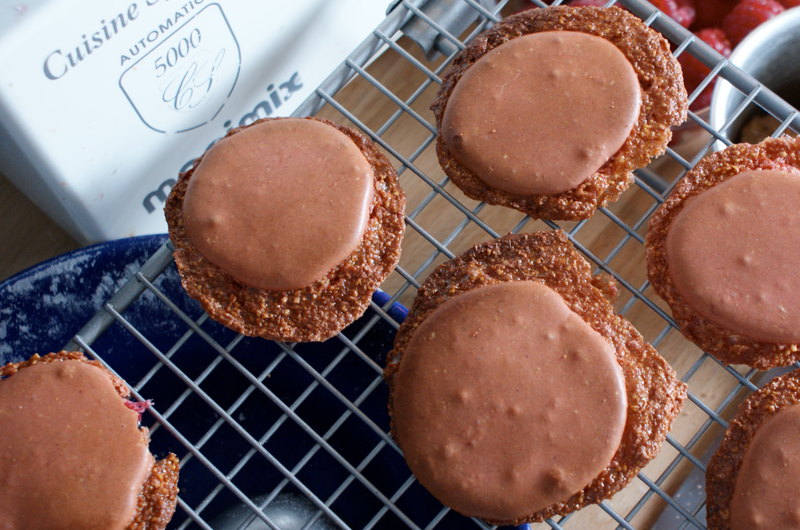 Blogging has taught me to be incredibly critical of macarons. Even professional ones often have some flaws. With practice I'm sure I can remove some - and that should be part of the fun. 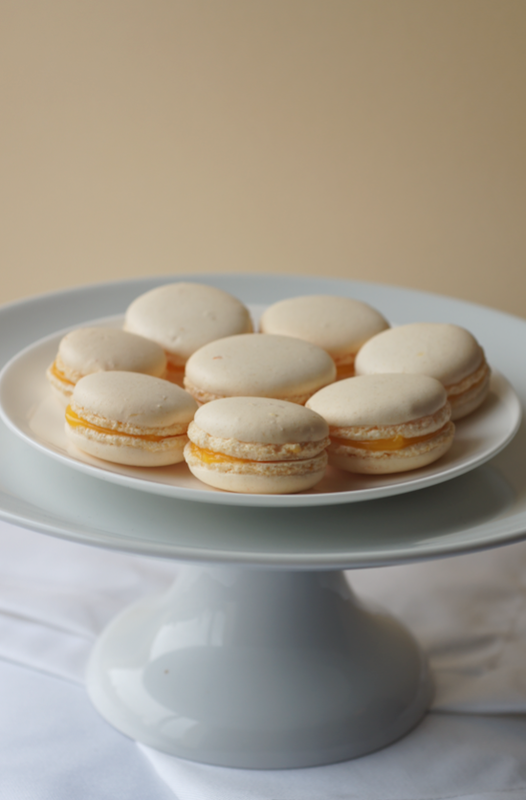 This time I used Ms Humble's recipe for lemon macarons and her three guides to Italian macarons. 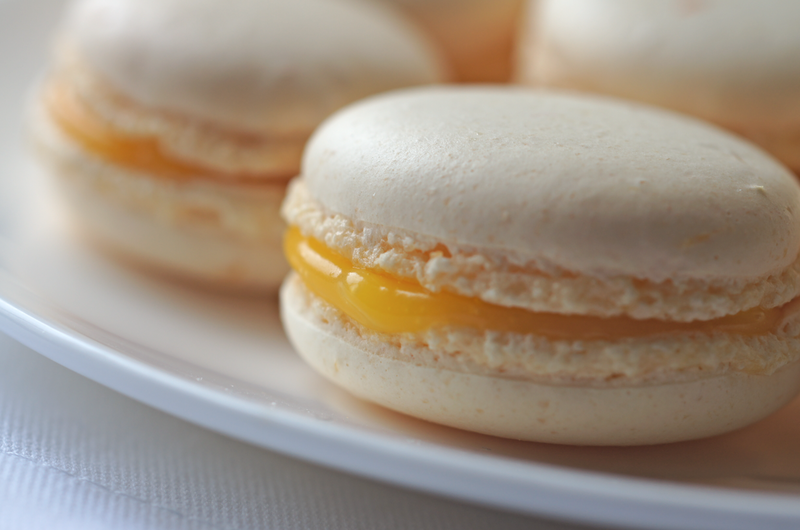 I then filled them with leftover lemon curd made with David's wonderful recipe. Emma, you and I should chew macarons over masala chai one day. At least you cried over macarons. I cried over my flopped sourdough (starter didn't barf strongly enough). I'm still waiting to gather enough courage to face it again (probably with some improvising). I would sit and sulk over cake that's just a little dry, a little wet or a tad crooked. I take my food feedbacks really seriously and am my own worst critic. That's the way we roll, because we know what it's suppose to taste like and wanting to be perfect will make us learn continuously. Those are beautiful! And I'm sure they tasted great! The italian method is definitely the way to go though for all types of meringue based recipes I find. Like Pickyin said we are our own worst critics, and I too have cried and gotten angry over many cakes and bread recipes that have not gone quite how I want them too. But like you I try to show my disasters as well as it really helps us all learn from what we are doing, and believe me when I say you are one of the most accomplished and inspiring bakers I have seen in a long time! Keep up the fantastically beautiful work! You did it Emma!! bravo! Silly me had that as my like second baking challenge EVER when I started this blog three years ago. (http://strawberriesinparis.com/2008/03/18/time-to-make-the-macarons/) I have not tried them since. But if I ever do get married, I'm thinking I will want to give them away as bridal shower favors! I think they look great and you did a really good job. You should be very proud of yourself. shaz - Thank you! How would you say the texture differs? Aveen - I'm so glad I could help. I was hoping I might be able to give a few people heart to try again. You will conquer them! Michele - Thank you. It's great to finally have some that do taste and look nice. Nancy - Thank you so much for your lovely comment. It means so much when people say things like that. Also - love the Munchie cake! strawberriesinparis - You crazy lady! Though I have to say half of my problem was probably thinking that they were so difficult. They look incredibly good for a first go (or anyway) - you should make some more. They'd be lovely favours. I am also a perfectionist, which is exactly why I have NOT tried these yet. Your attempts at making these sound like my attempts to make caramel. I definitely cried. I only took a class at Oxford, and would have LOVED to go, I'm so envious of your life there.... I didn't have the traditional route..high school, then straight to college, it was actually the reverse. So glad to have stumbled upon your site. Ohhh I totally felt your pain with those early macaron failures, I experienced the frustration of many deformed shells and even these days I know there's still plenty of room for improvement. But your latest batch look so beautifully smooth! Definitely agree the Italian method is more reliable, but I'm a sucker for the French method :) Can't wait to see what macarons you come up with next! I don't know why, but there seems to be something magical about macarons. I only had macarons a few times but only one of them was truly delicious as it deserves to be. All the others were overly sweet and tasted like icing. For this reason I have wanted to try my hand at homemade macarons but haven't been brave enough. Now, after reading your post I'm totally encouraged! To me, you have reached perfection! Becky - You should try them! As for caramel - have you used David Lebovitz's guides here and here? They're really good. elle marie - It is definitely at times your best friend and worst enemy. Your education sounds fascinating. I had a bit of an unorthodox one too. Oxford is indeed an amazing place but Harvard sounds pretty great too! Stephcookie - Thank you - I was amazed at how smooth they were. I think I'm going to keep at the Italian for a while before I brave the French again though! I can absolutely relate to this. It's horrible when something you've put so much effort into ends up looking like SOUP. But, practice makes perfect! I love your pictures and seeing your transition in progress with macarons. Hello, I'm a Dutch Blogger and I think it is very funny that I wrote a similar story just a few days ago. Universal problems. I was so proud of my happy feet! I haven't tried the Italian yet, and although my 2nd. batch ever turned out rather well, there is still a long road to perfection. Yours look beautiful. Never really heard about the Italien Meringue! Came to this post from your 7 links piece and you don't know how well timed it is and how much your sentiments about perfectionism resonate. I am sending this to someone very close to me right now. 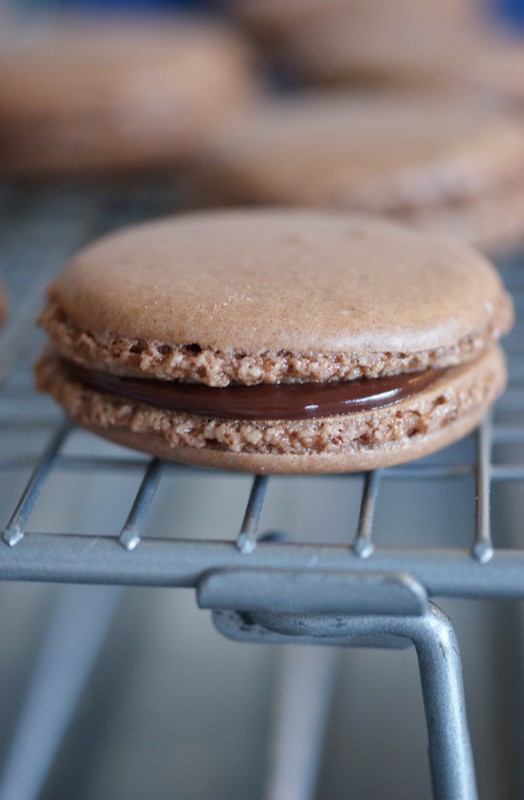 I was directed to this post on my blogpost I've written about how I can't do macarons. Like you I'm not the biggest fan of them, but not being able to make them drives me mad. Thank you for making me realise I'm not alone!